In the production environment we will configure the connections used in the deployed projects. When realize the first access to production environment, for security, we must create a new password. 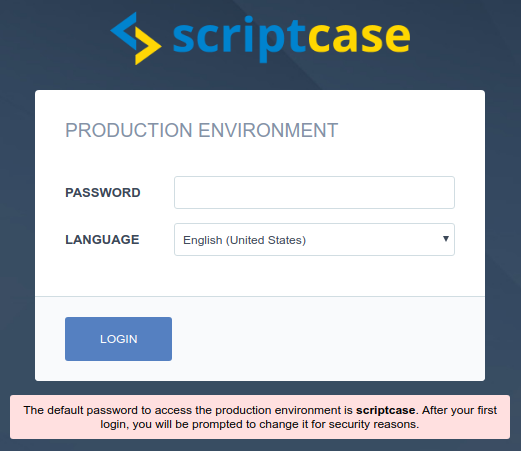 In first access, the default password always will be “scriptcase”. 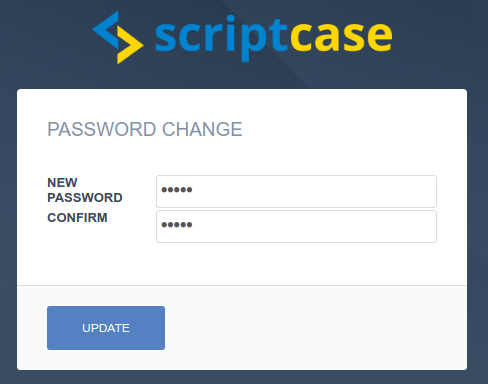 When we put the default password “scriptcase”, we must define our new password. Then we will be redirect to screen that inform the connections name that must be created. The connections must be created with the same connections names listed here, because it is about the connection names that the applications are using. We must choose the SGBD, the database that we will use to this project. Then we must inform the Database Server. If the database is in the same server that the applications we will be able to call they trough ‘localhost’. If the database is in another server, you will be able to connect the database trougth the machine Name or IP adress. We will inform the Login and Password to access the database(if possess). The connection in production environment should possess the same name in the used connection by the project in production environment. Connection name: Defines the name for the connection created. DBMS Type: Select the Driver type to the connection. Server/Host (Name or IP): Allows you to inform the machine Name or IP adress to your database server. Port (default): Allows you to select a port to establish the connection. Username: Inform the username to connect with your database. Password: Inform the password to connect with your database. Database name: Inform the database that will be used in the connection. Allows you to rename the connections in production environment. Select the connection that you wish to rename, and inform a new name to this connection. This procedure do not change the connection name that the project will use. The connection in production environment must possess the same name of the used connection by the project in the development environment. We must configure the APIs that we are using in our project with the same informations used in the development environment. Click here to see the APIs documentation.